WITH so many different translations of the Bible today, you may have asked yourself these questions. Which translation is right for me? Does it really matter? Well, we hope you will be able to answer these questions by reading the following pages. Let us keep in mind this important text from Revelation. "And if any man shall take away from the words of the book of this prophecy, God shall take away his part out of the book of life, and out of the holy city, and from the things which are written in this book." Revelation 22:19. John is speaking here of the book of Revelation, though the same would apply to any book of the Sacred Canon. That is quite a solemn promise that God has made, to have your name removed from the Book of Life. In His infinite wisdom, God knew that as time would pass, man would remove key passages or words from the Bible. The problem with "modernizing" or "changing" the Word of God is that it takes away from the original meaning what the Bible writers were trying to convey. Always remember this: "For the prophecy came not in old time by the will of man: but holy men of God spake as they were moved by the Holy Ghost." II Peter 1:21. Below you will find 200 key references that show how all modern Bibles differ from the King James Version, and the Greek Textus Receptus from which it was translated. You be the judge. 1:25 (FIRSTBORN) is out. Speaking of the Lord Jesus. 5:44 (BLESS THEM THAT CURSE YOU) is out. 6:13 (KINGDOM, POWER, GLORY) is out. 6:27 (STATURE) is changed to span of life. 12:47 (VERSE IS OUT) About Christ’s mother. 20:16 (MANY BE CALLED BUT FEW CHOSEN) is out. 23:14 (VERSE IS OUT) Woe scribes and hypocrites. 27:54 (THE SON OF GOD) is a son of God. 1:1 (SON OF GOD) is out in some Bibles. 6:11 (MORE TOLERABLE FOR SODOM AND GOMORRHA) is out. 6:33 (HIM) is changed to them. 9:44 (VERSE IS OUT) About fire not quenched. 10:24(FOR THEM THAT TRUST IN RICHES) is out. 13:33 (AND PRAY) is out or in italics. 15:39 (THE SON OF GOD) is a son of God. 2:33 (JOSEPH) is changed to father. 2:43 (JOSEPH AND HIS MOTHER) is changed to parents. 6:48 (FOUNDED UPON A ROCK) is well built. 11:29 (THE PROPHET) is out. About Jonah. 21:4 (CAST IN UNTO THE OFFERINGS OF GOD) is out. 23:38 (LETTERS OF GREEK, LATIN, HEBREW) is out. 24:40 (VERSE IS OUT) Christ showed them hands, feet. 1:14 (BEGOTTEN) is out in 1:18, 3:16, 3:18. 5:4 (VERSE IS OUT) Pool of Bethesda. 7:53 (TO 8:11) is taken out, in brackets or italics. 8:16 (FATHER) is out. Changed to He. 9:35 (SON OF GOD) is out. Is Son of Man. 11:41 (WHERE THE DEAD WAS LAID) is out. 1:16 (OF CHRIST) is out or in italics or brackets. 8:1 (LAST 10 WORDS ARE OUT) or in italics. 10:28 (THE EARTH IS THE LORD’S) is out and more. 11:31 (CHRIST) is out or in italics. 1:14 (THROUGH HIS BLOOD) is out or in italics. 3:6 (SONS OF DISOBEDIENCE) is out. 3:11 (CHRIST) is out or in italics. 3:13 (CHRIST) is out or in italics. 1:8 (CHRIST) is out or in italics. 2:7 (IN CHRIST) is out or in italics. 1:11 (OF THE GENTILES) is out. 4:22 (JESUS CHRIST) is out or in italics. 1:4 (THE LORD) is out or in italics. 9:12 (HOLY PLACE) changed to– Most Holy Place. 5:10 (JESUS) is out or in italics. 5:11 (GLORY AND DOMINION) is out of some Bibles. 2:9 (to be punished) changed to– under punishment. 2:17 (FOREVER) is out or in italics. 6:1 (AND SEE) is out in 3, 5, 7 also. 8:13 (ANGEL IS EAGLE) Greek text says "angel." Compare With 200 References listed above. Words omitted, in brackets, parentheses, or italics are counted as not authentic according to modern scholarship. Below you will find from 0 to 200 omissions in all of the popular Bibles. *It must be noted that although the New King James Version has only 2 omissions from the N.T., we also found the NKJV removes the word "Lord" 66 times, the word "God" 51 times, and the word "heaven" 50 times. 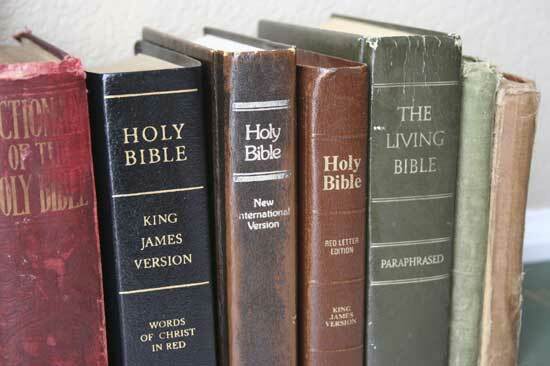 The NKJV also makes over 100,000 word changes, and most will match the NIV, NASV, and RSV! In the NT alone it also removes 2,289 words from the KJV. It also has 145 "significant textual variants" listed in the center-column reference section of each page. These textual variants are from the modern eclectic or "critical" text which depends heavily upon the Alexandrian type of text. Be careful of these references!